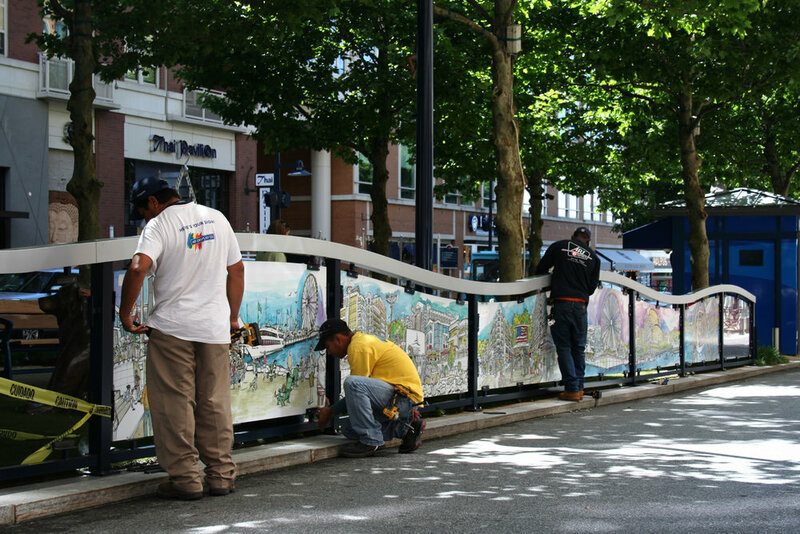 In the summer of 2016, I was contacted by developers at National Harbor, MD to discuss a mural commission right in the heart of the city. I was lucky enough to take a trip down to National Harbor and meet with some of the wonderful people who have spent the last decade essentially building a new city right outside of Washington, DC. 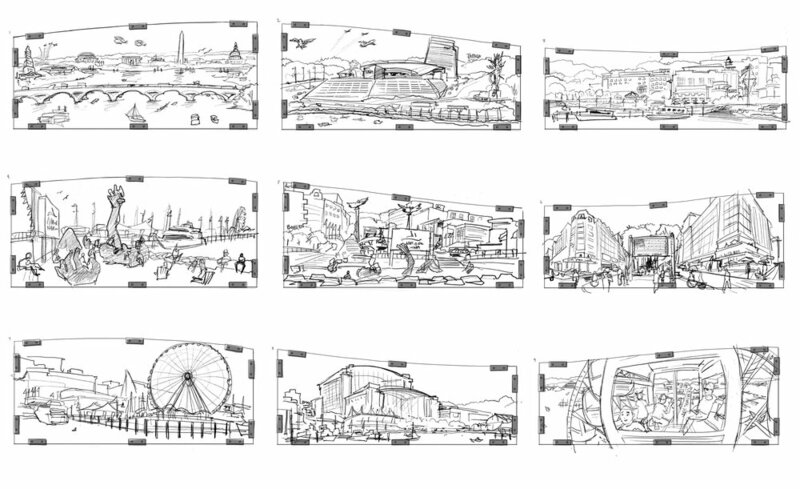 The client was looking for a 360 degree panoramic representation of the city, including the Woodrow Wilson Bridge, the MGM Casino (which at the time was still being built), the harbor along the Potomac, and everything in between. 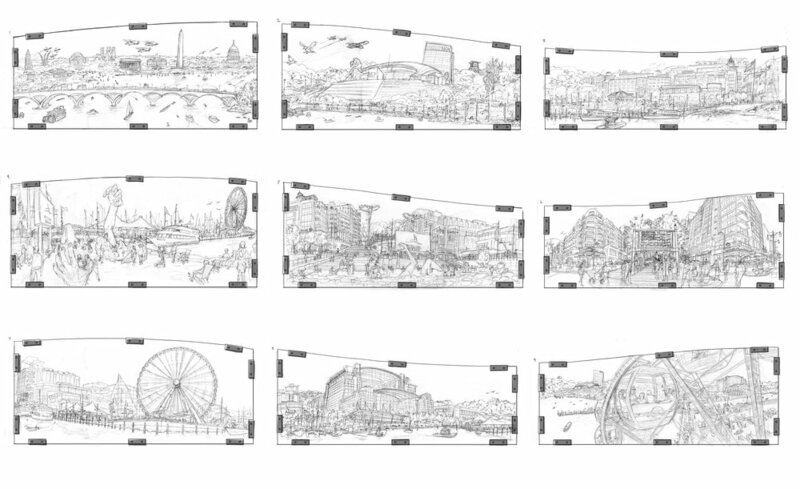 I officially took on the project and would spend the next seven months traveling to National Harbor - drawing, documenting, writing, photographing, and meeting with residents and employees. The biggest challenge in taking on this assignment was creating custom artwork that would fit in an already existing wall template, which as you can see below, has nine curved panels and is slightly downhill. 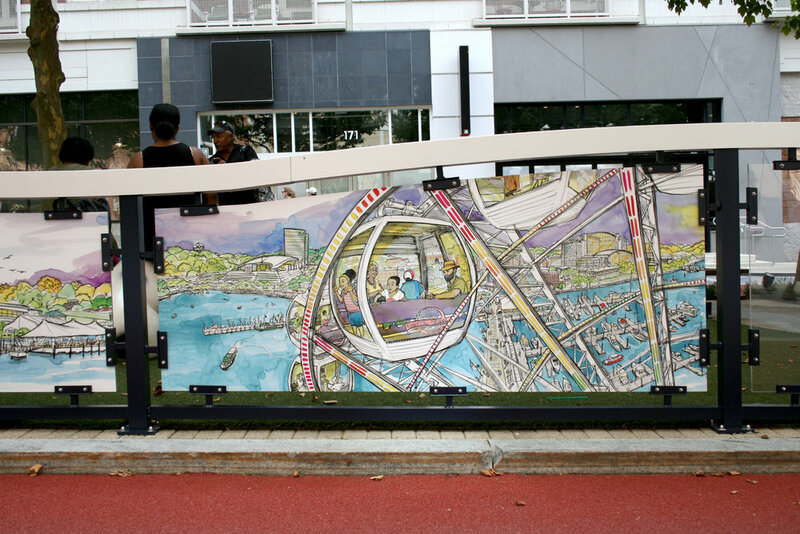 The wall separates a children's playground area and a one way street in the middle of the business district, so finding a way to have the entire mural flow seamlessly was fun yet forced us to think outside the box. I spent about a month in research and reference collection (both reportage drawings and photos), approximately a month to design and sketch the wall, and another 4/5 months finalizing the art after approval. 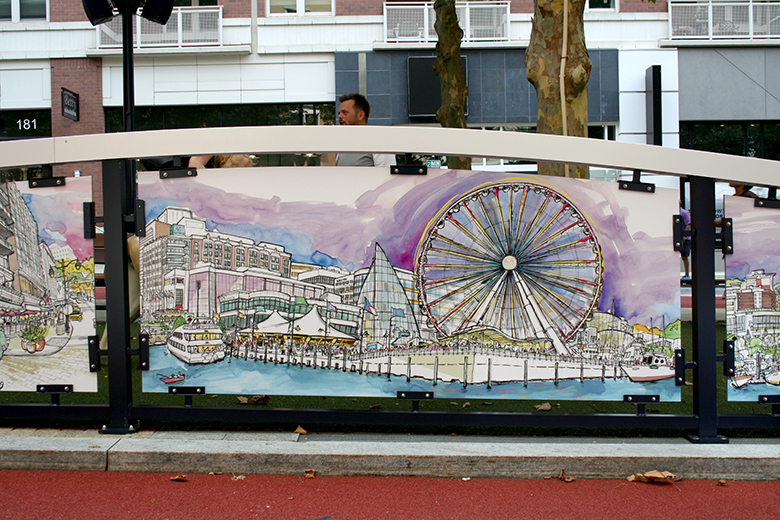 The end result is a permanent double sided mural spanning over 75 feet along American Way in National Harbor. It was installed in May of 2017, a process of which I was thrilled to be a part of. 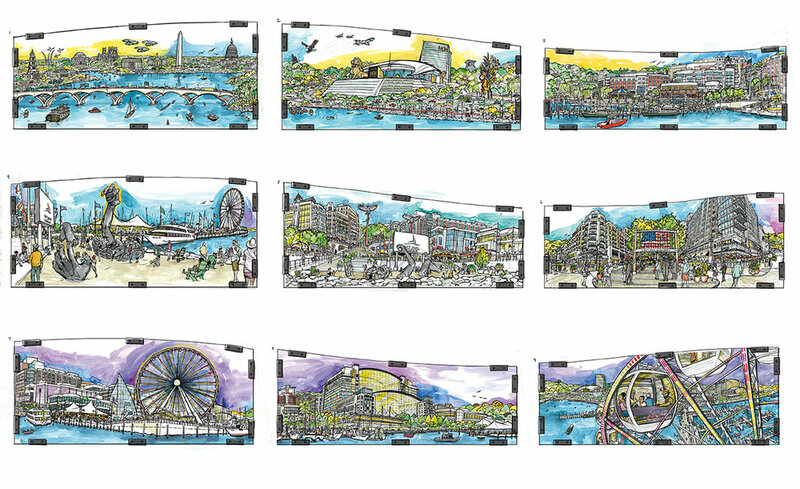 The entire project is a high point in my career so far, and I am so grateful to the people of National Harbor for the opportunity and taking the risk of hiring artists to display work across the city. 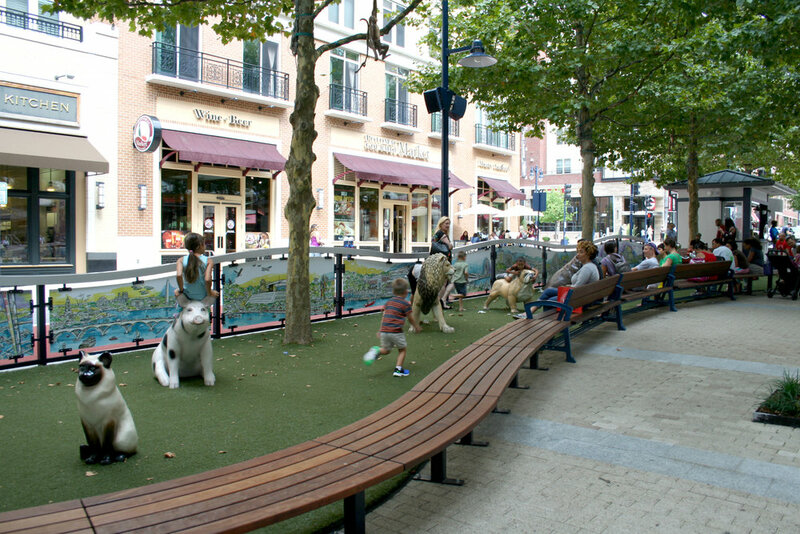 If you find yourself in the DC area, take a stop by National Harbor and see it for yourself!